As a private well owner, you are responsible for the quality of drinking water supplied to your home. On average, only 10% of well owners sample drinking water wells annually. At a minimum, a well should be sampled for bacteria and nitrate every 15 months. In karst areas of Calumet County, more frequent sampling is recommended. Presentation given on February 13, 2019 at the Engler Center for Performing Arts. Test kits are available in the Land & Water Conservation Department for a $3 deposit. The bottles can be used to test for coliform bacteria, E. coli, Nitrates, pH, conductivity, hardness, and chlorides. The kits are returned via mail to the UW-Stevens Point Water and Environmental Analysis Lab. Kits may be picked up at the Land & Water Conservation Office in room 227 at the Calumet County Courthouse. Want to learn more about private wells? This free online class is a short series of weekly programming for homeowners on private wells. Click here to sign up and get started. This is highly recommend for residents that are new to owning a private well. The Land & Water Conservation Department collects private well data from program volunteers to determine the current condition of groundwater resources and trends in water quality. The most recent report was released in July 2018. The report highlights the 2018 Group Testing Event held in May (2018) as well as the current average water quality in private wells (2005-2018). The karst areas of Calumet County are sensitive to groundwater contamination. 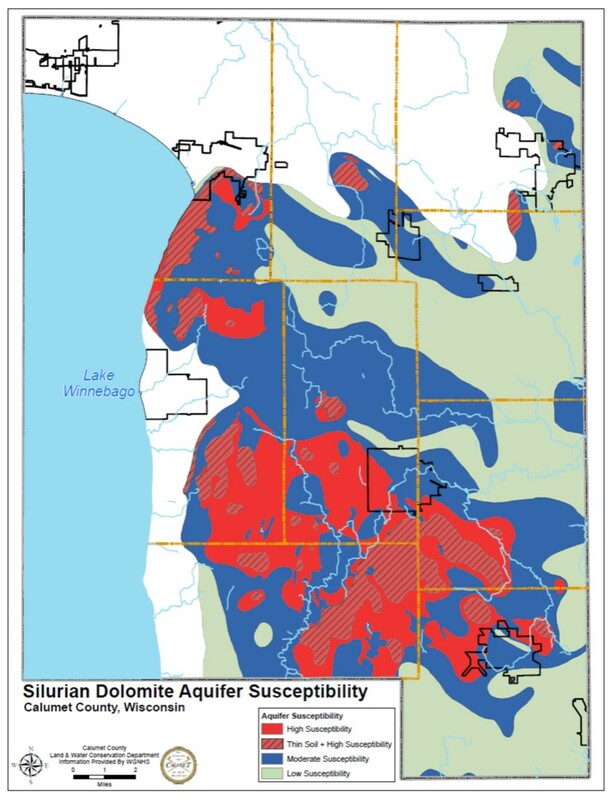 The unique geology and soils present extreme challenges in protecting groundwater from surface contamination. The upper layer of bedrock is a type of rock that is easily dissolved by water. Sinkholes, disappearing streams, and caves are visible examples of places where bedrock is dissolved. Vertical and horizontal fractures (or cracks) that for from dissolution act similar to network of pipes underground and can rapidly move water (in some cases, water can move 100 feet or more per day) from the surface to the underlying aquifer. In some areas, the soil can be very shallow (0-40 inches thick) and/or can consist of light textured materials. Soil is important for protecting water quality because it naturally filters contaminants picked up by rainwaters and snowmelt before they reach groundwater. Where there is little soil or light textured soil, there is little to no natural filtering of contaminants. Pollution on the surface of the land can directly and quickly impact water underground, creating significant health concerns if the contaminants reach wells. Calumet County’s private well testing program is a voluntary program that has sampled over 1800 wells since 2005. With over 4000 samples to date, the results indicate that over 1/3 of wells do not meet safe drinking water standard requirements for bacteria and/or nitrate. Water Health Series: Filtration Facts - in depth information on different treatment systems available.